Tomorrow is the 100th anniversary of the sinking of the Titanic. So what does this have to do with beer, or even the Beer of the Week? 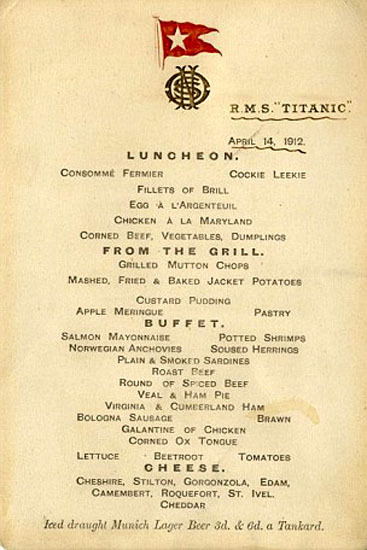 At the end of March, I was reading that the original menu from the last first class lunch, in fact the very last meal served aboard the Titanic, was up for auction. It survived because one of the passengers, Mrs Dodge, slipped it into her handbag as a souvenir. It sold for $120,000! One might expect that champagne would be featured on the menu, but no. Instead the menu offered Iced Draught Munich Lager in 2 different sized glasses. The first lagers were dark but in 1842 in Pilsen, Bohemia, Pilsner Urquell came out with a golden coloured pilser style lager that became quite popular throughout the world. Chilled pilsner went very well with a meal. Munich pilsners in the early 1900s were considered the finest in the world so it is not surprising that First Class passengers were served an Iced Draught Munich Lager with heir evening lunch. Josh Rubin from the Toronto Star wrote a short article on the Munich Lager served. 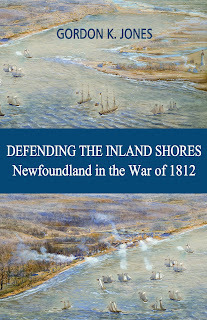 Unfortunately I did not keep the article and it was never put online. I did write down from it, though, that Mr. Rubin said that if one wanted to taste a Munich lager much like would have been served on the Titanic then Spaten Original Munich Beer, a lager from Spaten Brewery, would be a very good choice. 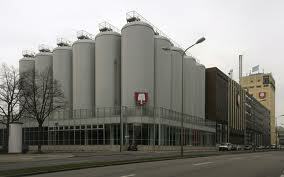 Spaten Brewery has been around since the 1397 and was bought by Gabriel Sedlmayr in 1807. It was his son, Gabriel, that made the company a success. According to the Oxford Companion to Beer, Spaten "is regarded as the most significant German brewery in the development of lager brewing". In fact, Gabriel came out with its own golden lager just a year after the pilsner style was invented. Spaten became so popular that it started exported its lager overseas in 1909. So time to taste the style of beer served during the last first class meal aboard the Titanic! The beer pours a very light golden colour and is clear enough that it is very easy to see through. The head is fluffy and white and leaves white lacings on the inside of the glass. After pouring, the beer is not very effervescent as it sits rather flat in the glass. The beer has a little bite to it and there is not really a finish as much as there is an after taste. I am disappointed as there is very little to this. Perhaps it is because this lager uses a "hop extract" along with regular hops. In any case, this beer is not crisp and refreshing. Hopefully the Munich Lager served aboard the Titanic during its last meal was a far better one than this one.